The Autobiography of Malcolm X is the story of one of the remarkable lives of the twentieth century. Malcolm X, as presented in this as-told-to autobiography, is a figure of almost mythic proportions; a man who sunk to the greatest depths of depravity and rose to become a man whose life’s mission was to lead his people to freedom and strength. It provides a searing depiction of the deeply rooted issues of race and class in America and remains relevant and inspiring today. 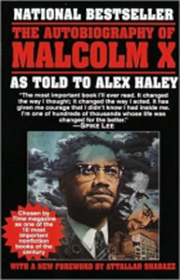 Malcolm X’s story would inspire Alex Haley to write Roots, a novel that would, in turn, define the saga of a people. What made the man so extraordinary was his courageous insistence on finding the true path to his personal salvation and to the salvation of the people he loved, even when to stay on that path meant danger, alienation, and death.